For nearly a few centuries, the northern Atlantic was the center of the world economy. This era is over. It has been over for some time. Since the early 1980s, more goods cross the Pacific than the Atlantic. This is a crucial development in our lifetime. Neither the 1997-98 Asian Financial Crisis, nor the Great Recession altered this fact. 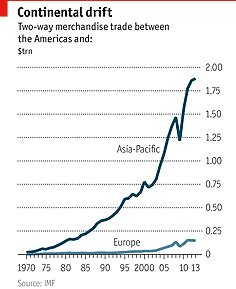 This Great Graphic from the Economist illustrates that America’s trade with Asia-Pacific dwarfs trade with Europe. The Trans-Pacific Partnership (TPP) is a US initiative to consolidate its geopolitical 'pivot' to Asia. The TPP does not envisage China joining, though PRC officials have both expressed vague interest in joining and establishing a parallel regional trade-bloc. Countries that are negotiating TPP account for about 40% of the world's GDP and 30% of world trade. Perhaps the most controversial part pertains to the investor-dispute settlement mechanism. This is an extra-judicial process that allows companies to object to national or sub-national laws that might not be directly related to trade, such as environmental and compensation laws, for example. Some observers think that with the Republicans having a majority in both chambers, they are more likely to grant Obama Trade Promotion Authority. It was the Democrats in the Senate that blocked it from coming to a vote earlier this year. Yet, this seems somewhat naive. It is not a question of principle. It is a question of politics. Why would the Republicans facilitate an important legislative success for the Democrat president? Moreover, the other principle involved here is the constitutional right of Congress to advise and consent, which some argue is abdicated in Trade Promotion Authority, which allows the executive branch to negotiate, largely secretly, and then present to Congress for an up-down vote.